This title will be released on May 2, 2019. How do we preserve what makes us human in an age of uncertainty? Are we now just consumers shaped by market forces? A sequence of DNA? A collection of base instincts? Or will we soon be supplanted by algorithms and A.I. anyway? In Clear Bright Future, Paul Mason calls for a radical, impassioned defence of the human being, our universal rights and freedoms and our power to change the world around us. Ranging from economics to Big Data, from neuroscience to the culture wars, he draws from his on-the-ground reporting from mass protests in Istanbul to riots in Washington, as well as his own childhood in an English mining community, to show how the notion of humanity has become eroded as never before. In this book Paul Mason argues that we are still capable - through language, innovation and co-operation - of shaping our future. He offers a vision of humans as more than puppets, customers or cogs in a machine. This work of radical optimism asks: Do you want to be controlled? Or do you want something better? This title will be released on June 11, 2019. 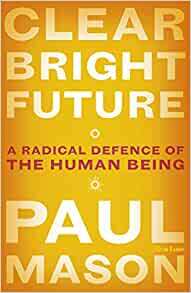 Pre-order Clear Bright Future: A Radical Defence of the Human Being for your Kindle today. Paul Mason is an award-winning writer, broadcaster, and film-maker. Previously economics editor of Channel 4 News, his books include PostCapitalism, Why It's Kicking Off Everywhere: the New Global Revolutions; Live Working Die Fighting; and Rare Earth: A Novel.